In my previous post, I wrote about how a brand hopped onto the “diabetes” bandwagon through a minor change in their existing product mix. In today’s post, let me share with you an example of how a brand not only tweaks its product slightly but also commands a premium by taking a “diabetes” focused positioning. I discover such new products, thanks to food bloggers who generously promote them. One such discovery is this new “Sugar Release Control Atta” under the parent brand of Aashirvaad from ITC. I even saw a huge hoarding in ORR (Bangalore) a few weeks back. Aashirvaad Sugar Release Control Atta is a blend of whole wheat flour and pulse/legume flours forming a unique "Natural Grain mix". Ingredients like Oats and Methi ensure that this Atta is high in protein and fibre with a Low Glycemic Index. So through this product, is the brand saying that all those diabetic patients who eat regular wholewheat chapathis for dinner aren’t regulating their sugar levels and that they need much more than that? Can we conclude that wheat alone is insufficient to regulate sugar levels? What about their existing product “Aashirvaad multigrain atta” that was launched a few years back? Doesn’t it include “a mix of wheat flour and legume flours”? What’s different and new in this new “Sugar release control” atta? 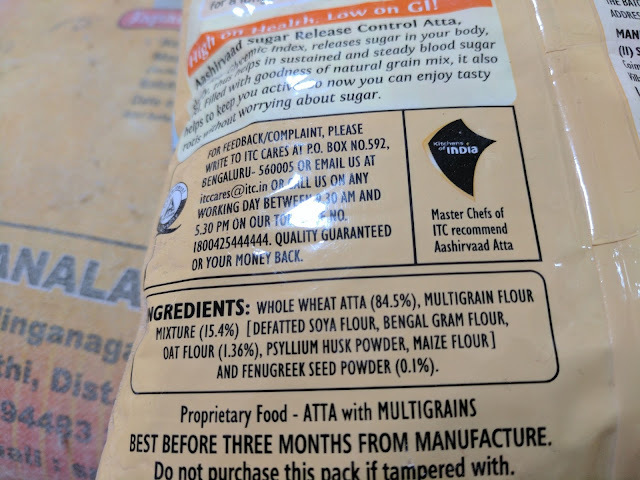 As you can see, the ingredients are EXACTLY the same between multigrain and sugar release control atta, except for 0.1% of fenugreek powder. The percentages of the other flours were not mentioned in the pack of sugar release control atta. I wrote to ITC to share the % figures but I haven’t received a response yet. The percentages of the various flours are tweaked slightly in this new product. Assuming the ingredients list is in decreasing order, in the multigrain flour mix, the highest contributor is soya flour, followed by Bengal gram flour (besan). What’s most interesting is the price point. The “sugar release control” atta is priced 11% more than multigrain atta and 20% more than wholewheat atta. By tagging with buzzwords such as “diabetes”, “sugar release” etc, the brand is commanding a premium. For the target segment, this premium price doesn’t create any dent in their pockets. “Just noticeable difference” (JND) is minimal in this case and the switching costs are nil. So irrespective of whether people have diabetes or not, they wouldn’t mind switching to this new brand, thereby contributing to increased profit margins of the parent brand. Do we really need a separate diabetic-focused atta? Not at all. This is what I’ve been following for the past 3-4 years. I buy regular wholewheat atta and also a bunch of other flours like ragi, bajra, jowar, amaranth, bengal gram (besan), other minor millets etc. Whenever I make the dough, I mix equal proportions of wholewheat and one of these flours. So it would be say, 50% wholewheat atta and 50% ragi flour. This way, I can consume considerable proportions of other grains that are gluten-free, high in protein and fibre. It’s so simple and easy to take control of this proportion mix. It doesn’t make sense to hand over this control to a brand that just gives me <15% of other grain flours and command a 20% premium. P.S. Adding just 0.1 gm of fenugreek powder (in 100 gms of flour) and then calling it out explicitly as part of their brand promise - Isn't that weird? percentage. However, what we can share is that the multigain flour mixture comprises of 15.4%, which includes defatted soya flour, bengal gram flour, oat flour (1.36%), psyllium husk powder, maize flour as well as fenugreek seed powder (0.1%)." The same as what is mentioned in the packaging.